Tinkering with a method they helped develop over the last few years, scientists have for the first time measured at the nanometer scale the characteristic patterns of folds that give proteins their three-dimensional shape in water. Developed by researchers at the National Institute of Standards and Technology (NIST) and their colleagues, this technique will help scientists gain insights about the behavior of biomolecules in watery environments similar to those in cells. These insights, in turn, could increase our understanding of major diseases, including Alzheimer's, that are related to "mistakes" in protein folding. Life as we know it couldn't survive if proteins didn't fold into precise patterns leading to helices, sheets and other shapes that give proteins their three-dimensional structure. The precise shapes of proteins enable them to carry oxygen, fend off harmful bacteria and perform other essential tasks in the body. Proteins that fold improperly cannot function and sometimes generate toxic fragments, such as those associated with neurodegenerative disorders. To understand the intricacies of folding, scientists need to study the detailed arrangement of chains of amino acids that are shorter and simpler than proteins—called peptides—and how they fold, assemble and rotate to create a variety of shapes, or conformations. Biologists prefer to examine proteins and peptides immersed in water because that environment closely approximates the conditions inside living cells. Previously established techniques for determining the conformation of proteins, such as infrared spectroscopy, lack the fine spatial resolution to study the tiny and diverse assemblies of properly folded and misfolded proteins. In addition, these techniques don't work well in an aqueous environment because water strongly absorbs infrared light, confounding the analysis. Water had also posed severe challenges for a pioneering technique, known as photo-thermal induced resonance (PTIR), that recently enabled researchers to examine peptide structure and conformation in air with nanoscale resolution. NIST researchers and their colleagues have now demonstrated that PTIR can be adapted to obtain conformational structure at the nanoscale in water using two chemically similar peptides known as diphenylalanine and Boc-diphenylalanine. Diphenylalanine is related to beta-amyloid, a sticky, larger peptide linked to Alzheimer's disease. "PTIR is a powerful technique that had already shown promise for the study of biological systems, but the possibility to use this with samples in a liquid environment will greatly improve its use in this area," said Georg Ramer of NIST and the University of Maryland in College Park. Ramer and NIST researcher Andrea Centrone, along with their colleagues at the University of Cambridge in England, described their work in an article recently posted online at ACS Nano. 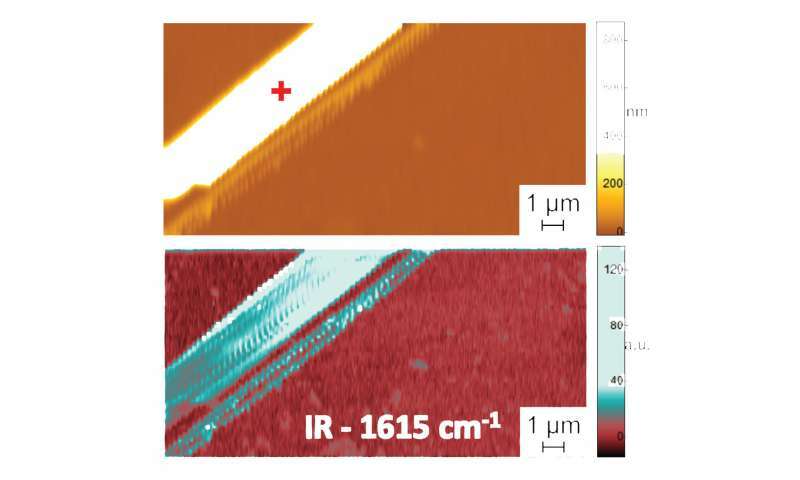 PTIR determines the chemical composition of materials with nanoscale resolution by combining an atomic force microscope (AFM) with light from an infrared laser that operates over a range of wavelengths. The characteristic wavelengths of infrared light that are absorbed by the sample are akin to a molecular fingerprint, revealing its chemical composition. At each site on the sample where infrared is absorbed, the material heats up, causing it to rapidly, but ever so slightly, expand. The expansion is detected, with the sharp tip of the AFM protruding from a cantilever, which oscillates like a diving board each time the sample expands. The more light that is absorbed by the sample, the greater its expansion and the larger the strength, or amplitude, of the oscillations. As good as PTIR is, using the method in a water environment is problematic. Water strongly absorbs infrared light, producing an absorption signal that can interfere with efforts to discern the sample's chemical structure. In addition, the drag force exerted by water is much stronger than in air and it typically weakens the PTIR signal, as it strongly damps the oscillations of the AFM's cantilever. To limit water's absorption of infrared light, the team placed a prism between the laser and the sample. The prism served to confine the infrared light to the sample's surface, minimizing the amount that could leak out and interact with the water. To address the damping problem, the team used a laser that could operate at frequencies up to 2,000 kilohertz. That enabled the researchers to match the frequency of the laser pulses to one of the higher frequencies at which the cantilever oscillates. Like pushing a child on a swing at just the right interval, the frequency matching enhanced the amplitude of the cantilever's oscillations, partially offsetting the damping due to water. To demonstrate the accuracy of their method, the team compared PTIR measurements of diphenylalanine and other peptide samples in two environments: water and air. (The peptides folded similarly in both mediums, making it easier to perform the comparison.) 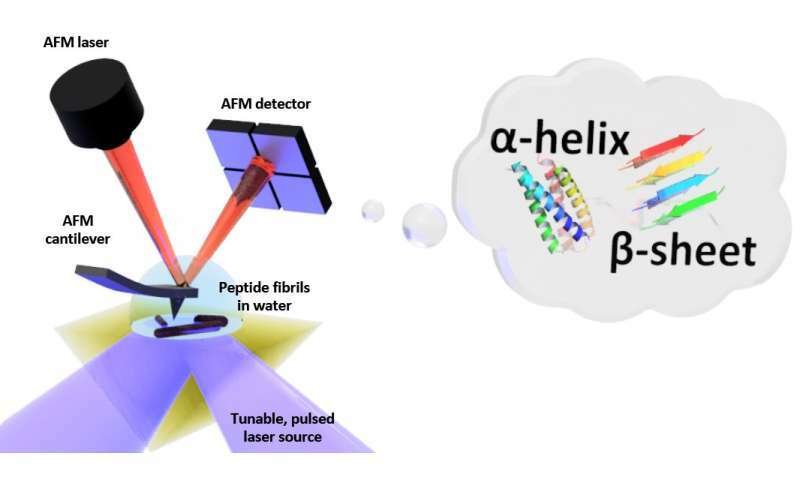 Remarkably, the scientists achieved similar spatial resolution and contrast in water and air, demonstrating for the first time that measurements in a water environment can be performed accurately, revealing the precise conformation of peptides with nanoscale resolution. "This finding is important to biologists who want to understand protein structure and folding in environments as close as possible to those in cells," said Centrone.